Miller would go on to form Miller & Sons, a famous piano making company. Pittsburgh, PA 1869-1873 Charles Meyran and Reinhold Siedle. Portsmouth, NH c. 1856-1876 Watchmaker. and James W.L. Brown. Jewelers. Wm. P. McKay & Co. Founded by William P. McKay and Henry T. Spear. 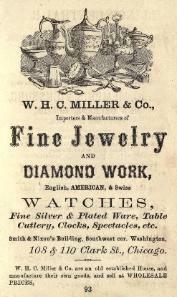 Boston, MA 1856 Watchmakes and jewelers. 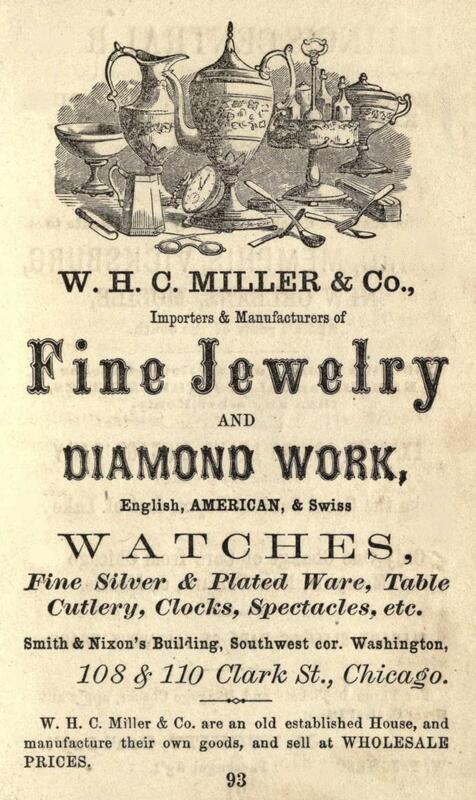 Chicago, IL c. 1860-1871 Manufacturing jeweler. St. Louis, MO 1879-1901 Founded by Harrison H.
by Mermod, Jaccard & Co.
the partnership of Jones & Mershon with George A. Jones 1864-1872. Succeeded in 1889 by Bauer Bros. Watchmaker and jeweler. Mark W. Merrill and John N. Barr. Dry goods merchants. continued the business under his name until 1899. Indianapolis, IN 1853-1877 Was a partner in the firms of E.J. Baldwin & Co.